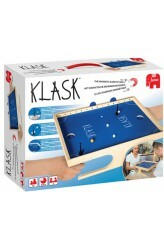 The KLASK game board is shaped like a ball field with two deep holes functioning as goals in each end of the field. In the middle of the field, three white magnetic pieces serve as "obstacles" – do NOT attract them to your own gaming piece! Your gaming piece is a black magnet. You control it by holding a large magnet under the board. This magnet is connected to a small magnet placed on the field. The purpose of the game is to push the small, red ball around on the field with your magnet/gaming piece, shoot the ball past the obstacles and your opponent and into the goal hole (Klask). It’s so much fun when your opponent suddenly is covered in white obstacles or you drop your gaming piece into the goal – something which might happen if you get a little too eager! Place the ga..